It seems like one day I had never even heard of Benny Friedman and the next day everyone was raving about Avraham Fried’s nephew with the amazing voice. For almost two years, the Jewish music industry has been buzzing about this CD, making this one of the most eagerly anticipated albums in memory. Does it live up to the hype? There is no magic here, no fairy dust. Don’t expect to be hit by a bolt of lightning when you initially hear it. At first listen, there may be a few songs that grab you. But this CD is viral. Once you start listening, it just takes over. The more you hear, the more the songs start to worm their way into your heart. You notice subtle touches here and there. How solid the compositions are. How the delicate harmonies add so much to the songs without overpowering them. How the arrangements take the songs to the next level. And how magical Benny’s voice is – so smooth, so silky. Once Benny fever hits, don’t even try to fight it. Because you’re not going to be able to resist. You might as well just give in and start singing along. Every aspiring Jewish singer dreams of being Benny Friedman. The one in a million guy who oozes talent and has the right people behind him to make it all come together. From the moment you meet him, it is obvious that there is something special about Benny. He is personable, unassuming, and genuinely real. He is the kind of guy you want your son to become, in more ways than one. Despite the fact that Benny grew up in a family that had more than its fair share of musical talent and certainly did his time singing in the occasional grade school performance, Benny never dreamed of becoming a singer. Instead, he dreamed of hitting it big in baseball. Home run king. Ace pitcher. No one can deny that Benny has certainly hit the big leagues these days. It just isn’t the MLB. In time Benny realized that just singing wasn’t enough. He needed to record an album. Not to make money, not to become famous, but because he truly loved music. Avremi G. helped Benny get noticed at Sameach music, where IzzyTaubenfeld, A’H, took special interest in Benny and his music. But it was graphics whiz Sruly Meyer who made the ultimate shidduch, pairing Benny with AviNewmark, the talented producer who seems to have the gift for taking up and coming singers and transforming them into stars. It seems to have been a match made in heaven. Benny describes Avi as the consummate producer and an absolute pleasure to work with. Someone with a great ear and a great vision, who is persistent, strives for perfection, but is still always open to suggestion. When asked why of all the talented producers he went with Avi, Benny points to Avi’s ability to mix the mainstream with the less conventional and Avi’s total lack of fear when it comes to taking risks. In Benny’s words “I think it paid off big time.” For his part, Avi recalls hearing Benny sing for the first time, viewing a clip on Benny’s MySpace page. It was obvious that this young singer had tremendous potential and two and a half years later, Avi proudly admits that his initial impression was dead on. He describes Benny as someone who has the talent to have an impact on the Jewish music business, while at the same time having the strength of character to be a role model to up and coming singers. In a business where so many new artists feel the need to disparage others or proclaim themselves to be the next hot commodity, Benny somehow manages to see the good in everyone and is genuine, humble and incredibly down to earth. As for the CD itself, it is truly a potpourri of musical excellence. From the opening notes, it is clear that this may be one the best debut albums ever recorded. Twelve songs, every one different, yet each one upbeat, hopeful and optimistic in its own way. There is something so positive, so uplifting about listening to this album. When asked to name his favorite song on the album, Avi confesses that not only is this the first album he has ever done where every song was his favorite but it is also probably the best material he has ever worked with. Clearly, there is so much talent invested in this CD. Some of the best and the brightest in Jewish music get behind Benny to make this release everything the Jewish music world hoped it would be. Compositions by YitzyWaldner, Elimelech Blumstein, Yitzy Spinner, the Marcus brothers, Simche Friedman, Meshulam Greenberger and Oriel Avraham. Arrangements by Leib Yaakov Rigler, Mona Rosenblum, Moshe Laufer, Avremi G and engineer par excellence Ian Freitor whose creative fingerprints are all over this album. Choirs by Moshe Roth, Bentzy Marcus and the unbelievably talented Yitzy Spinner. AviNewmark is clearly at the top of his game as he skillfully weaves the intricate fabric of this album together, presenting us with an absolute gem. And then there is Benny himself. There is just so much to say. His four years studying with Seth Riggs, vocal coach tothe elite in secular music, have definitely paid off. Riggs raves about Benny, describing him as “one of the most exciting people I have ever met in my fifty two years of teaching”. Riggs goes on to say that Benny is clearly so talented and effortlessly hits notes that most people can only dream of. But like Benny himself, his singing is simple and understated. He doesn’t oversing the songs or try to show off. He sings sweetly, mellifluously and lets the beauty of his voice and the songs carry the CD. The album itself is a solid hour, jam packed with musical goodness. While it starts off with a bang, unlike most Jewish CDs, the further you get into the CD, the better it gets. Misod, the opening song is the perfect introduction to the wonderful world of Benny Friedman. The bizarrely named,yet mysteriously addictive No Lyrics, is mind numbingly deliciousand featuresuncredited backup vocals by Benny,Avi and Sruly Meyer. U’ksheim is a touching and poignant tribute to IzzyTaubenfeld, A’H, the man who gave so much to each and every one of us. Taamu, the title track is catchy and upbeat, with a haunting bridge based on a melody composed by the Alter Rebbe. In case you were wondering how Benny would sound davening for the amud, wonder no more as his voice soars during the uplifting Hameracheim. Moshiach is another one of those songs that will take up residence in your head and never, ever leave. The beautiful KadYasvun, aninspiring ballad, is both touching and captivating. Turn up the volume, because Amar will have you singing along the first time through, followed by the fabulousYaavducha, a country tune that is absolutely addictive. If you thought this CD just couldn’t get any better, you thought wrong. Letova, nicknamed “The Happy Song” in the studio, is pure musical joy and is impossibly irresistible.BatuachAni, Benny’s favorite on the album, is perhaps the song where Benny really shows off just how talented he is and how much he is capable of vocally. And while many artists bury their weakest song at the end of their CD, the Yiddish gem, Emes is the perfect ending to an album that is nothing short of sensational. Top to bottom, this album is a treasure trove of musical delight. It’s not just the music on this album that is original and forward thinking. The multi-talented Sruly Meyer, who served as both graphic designer and technical producer on this project, came up with a marketing plan that is equally creative and innovative. While this CD has been in the works for almost two years we haven’t been bombarded with endless interviews and tentative release dates. The marketing began just a few weeks prior to the release with those mysterious “Taamu” banners that appeared on Jewish music websites and werescattered throughoutseveral Jewish communities. 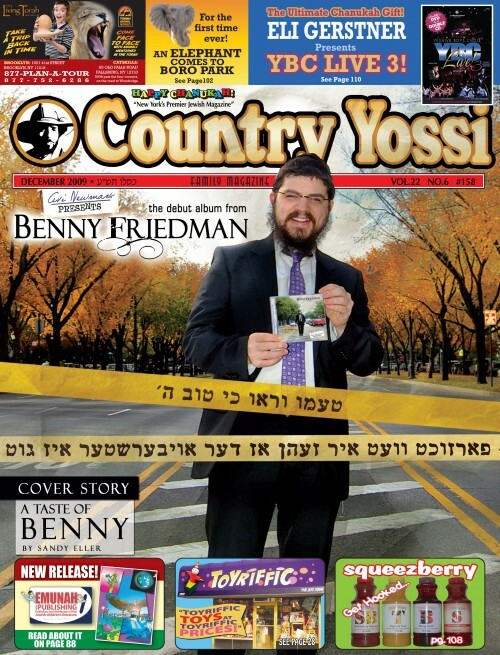 Next came the cover, featuring the now famous picture of Benny stridingconfidently down the middle of Eastern Parkway, followed by a video trailer on YouTube, which gave us the first tantalizing taste of what we could expect from Benny. Free ringtones from the album were actually available before the album was even releasedand everyone is invited to share in the fun by joining Benny’s Street Team (see bennysmusic.com for more details). And in case you missed the Jewish Music Report podcast, three copies of Taamu containcoupons for Benny to sing at your simcha. What was missing in the marketing plan? The hype and hoopla that are generally present when a new artist makes his debut. When you are as talented as Benny, as well known as Benny, that kind of noise just isn’t necessary. Besides, it’s just not who Benny is. Everything about this album is vintage Benny. Top notch, done to perfection, yet simple and understated. When you are as good as Benny, when your work is strong enough to sell itself, you just don’t need to shout about it. Does someone out there want to break the news to Benny that he is well on his way to following in his very famous uncle’s footsteps? We hope to be hearing that beautiful voice for many, many years to come.